How will chronic absenteeism data be presented on the school report card? The school as a whole will receive a performance measure related to the percentage of students who are missing more than 10% of their scheduled school days. Chronic absenteeism rates will never be reported at the student level. The Maine DOE or the school will never identify your child publicly as being chronically absent. Where eligible student groups include: Asian, Black, Hispanic/Latino, Two or More Races, White, Students with Disabilities, Economically Disadvantaged, Migrant students, Homeless students, English Learners and Parent in Military on Active Duty. To assist parents and community members in understanding chronic absenteeism, the report card provides “hover over” features that explain the definition of the performance level. Parents, educators and community members also have the opportunity to examine chronic absenteeism data by student group and to see the progress the school is making in reducing instances of chronic absenteeism school wide. 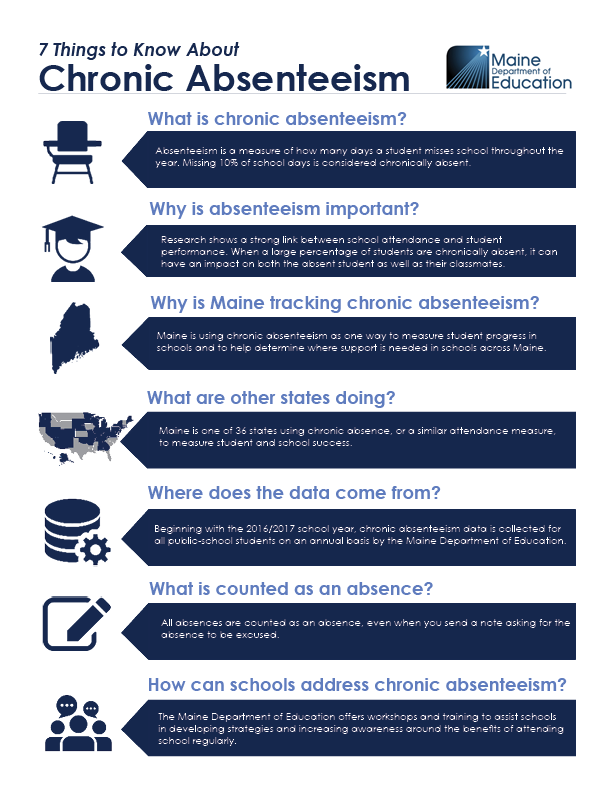 Download the Maine DOE’s Chronic Absenteeism Info Graphic as an additional resource. For further information or questions contact, Interim Director of Learning Systems Janette Kirk at (207) 624-6707 or Janette.Kirk@maine.gov.